"Silk from caddisfly larvae - known to western fly fishermen as 'rock rollers' - may be useful some day as a medical bioadhesive for sticking to wet tissues," says Russell Stewart, an associate professor of bioengineering and principal author of a new study of the fly silk's chemical and structural properties. "I picture it as sort of a wet Band-Aid, maybe used internally in surgery - like using a piece of tape to close an incision as opposed to sutures," he adds. "Gluing things together underwater is not easy. Have you ever tried to put a Band-Aid on in the shower? This insect has been doing this for 150 million to 200 million years." 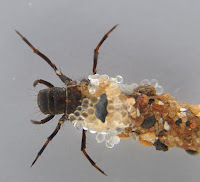 Stewart and study co-author Ching Shuen Wang - who works in Stewart's lab - studied the caddisfly species B. echo from the lower Provo River about an hour south of Salt Lake City. Bioengineering undergraduate student Nick Ashton gathered the fly larvae and figured out how to keep them alive in the lab. "It's like using Scotch tape on the inside of a box to hold it together," Stewart says. "It's really like a tape more than anything else - a tape that works underwater." The phosphates attached to the serines are negatively charged. Other amino acids in the protein are positively charged. Stewart found that is a key factor in making silk underwater. Chains of proteins - each with alternating regions of positive and negative charges - line up in parallel with positive and negative charges attracting each other. Stewart made a counterintuitive finding about how wet silks are made. "These fibroin proteins that make up the silks are water-soluble because of the electrical charges. Ironically - and this is our hypothesis for now - the association of those plus or minus charges makes them water-insoluble. This is how you make a silk fiber under water." He says the ability to make adhesives underwater now has been identified in four phyla - major categories of living organisms - that include caddisflies, sandcastle worms, mussels and sea cucumbers.